From Asher's back catalogue this was a ground-breaking blend of instrumental pieces... classical, religious, pastoral and visual... mixed with spiritual love-songs. Mystic Heart was unique at the time (1989) in the new-age genre, and Asher somehow manages to combine the baroque with the liturgical, and film soundtrack material with folk-songs. A best-selling album with great longevity, Mystic Heart unravels quixotically to be like an Albinoni concerto meeting Hans Zimmer, meeting the Greek orthodox church, meeting a wandering minstrel. Asher Quinn is a world-renowned composer and performer, as well as a Jungian psychotherapist. Writing and recording also under the names Denis Quinn and Asha, Quinn has sold over half a million records since breaking onto the New Age music scene in 1987. Over the last several years Quinn has become more of a lyric ballad singer with spiritual undertones. Comparisons have been made over the years to the likes of Ennio Morricone, Phillip Glass, Peter Gabriel and Leonard Cohen, but there’s no disputing that Asher Quinn is 100% an original. Mystic Heart, first released in 1989 and now repackaged on Quinn’s own label, continues in the otherworldly folk-troubadour tradition that has become Quinn’s mien over the past two decades. Mystic Heart opens with 'Canzone Angelica', showing a strong Baroque influence a la Johan Pachelbel. The brief vocal fugue three minutes in is quite lovely. 'Missa Greca' (Greek Mass) is pretty and uplifting while maintaining the darker tone you might expect from a Harold Darke mass if he were writing today. There is a contemplative beauty here that is striking, one that rises up to an apex in the form of the 'Kyrie'. 'Song Of The Cross' is full of reverence and a quiet grace; a biblically solid interpretation with license. 'Shepherdess’s Lament' is a mournful instrumental written for violin backed with orchestra. 'Allah, Hallelujah, Elohim' is a song of praise to God done in a simple folk/Celtic arrangement. Quinn uses a simple, repetitive structure here similar to a Rondeau, but allows the vocal line to remain unfettered and distinct. The result is a lovely melody line that takes on an almost chant-like quality. 'In Search Of The Miraculous' is six-and-a-half minutes of a John Tesh-meets-Windham Hill style of new age composition. The somber tone of the piece mixes with a pacing that speaks of pragmatism or perhaps even hope. 'The Longing' returns to the contemplative compositional style that seems to be one of Asher Quinn’s specialties. At over seven minutes, 'The Longing' never even introduces a vocal until four minutes in, relying on a cyclic composition to build a chant like feel; one maintained in the rhythmically repetitive vocal line. Mystic Heart closes with 'To My One True Love,' a love song/prayer to God with a gentle, wave-like feel. Quinn cries out from the midst of heartbreak to the one true thing he knows. No one will doubt the esoteric beauty of the compositions presented on Mystic Heart. Asher Quinn has a distinct ability to inhabit the nexus between new age, classical, pop and folk music. The styles and sounds of all four blend throughout Mystic Heart. Quinn’s voice as a singer is infused with a quiet power. Mystic Heart has much going for it musically. Quinn’s compositional style and musical choices border on the exceptional, and his willingness to cross genres and even musical periods brings greater depth and breadth to his work. 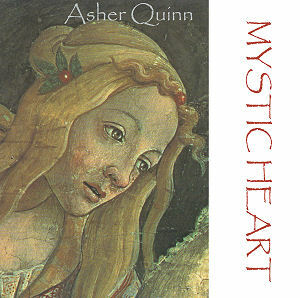 Asher Quinn distinguishes himself once again with Mystic Heart. I would like to thank you. If there is one song that healed my heart and my soul after my wife died in November 2006, only 10 weeks after our marriage, it is your wonderful song 'To my one true love'... God bless you. Hello Asher, you sent your lovely CD Mystic Heart a couple of weeks ago for me to write a review. I'm actually listening to it right now and it's helping a great deal with the plethora of emotions I'm experiencing. This music is timeless, ageless and quite beautiful. I live presently in Taos, New Mexico, but am originally from Scotland. Taos is a very spiritual place, and your music fits in very well with the energy here. Funnily enough, I too used to listen to Radio Luxembourg, secretly, under the bedclothes, like you say on your website! Your beautiful music has been with us for years, especially Mystic Heart. A Lebanese friend gave me the Mystic Heart album, and I immediately liked your voice. Your melodies captivated my heart with their endless melancholy and tenderness. In the song 'To my one true love' where it says 'somewhere deep inside, Thy tender heart, Thy grace, will provide' there is an extra heartbeat on the bass guitar. It think it is mine. Mystic Heart has hardly left the carousel of my CD player for several years. I use 'The longing' as an anchor to my centredness every few days, an anchor that would seem to perform indefatigably. Dear Asha, I am an holistic healer and I recently bought Mystic Heart from New World and it's absolutely brilliant - really angel-inspired, whether you realise it or not. The angels adore this music, especially 'Allah, Hallelujah, Elohim'. Many times I have listened to the Mystic Heart. I find this music really great for the realms of the unborn, the born ones and them who live forever. Earlier today, someone lent me Mystic Heart. What an experience! During several of the songs I had tears of joy running down my face. Mystic Heart is still my favourite of all your tapes. The heart energy in this one is quite outstanding, and I use it a lot in workshops when I am opening the hearts of the people who come. Dear Asha, I felt I must write to you in response to your music of the Mystic Heart. I have listened to it many times loving it, especially 'The longing', but today I heard, really heard 'The song of the cross' and understood what you were singing. It struck home, an arrow true to the heart. God bless you. I particularly like 'Missa Greca' and 'Allah, Hallelujah'. High music indeed! The 'Missa Greca' is one of the favourites amongst the members of our centre. We often play it before our sessions as a way of getting attuned. My favourite track is the 'Missa Greca'. It's the kind of song I've been searching for all my life. I first heard Mystic Heart in a church before a lecture about angels. I'd like to write and express my gratitude for this recording. God blessed you when you made the songs on Mystic Heart and Open Secret. God blessed me when I heard them.